Briggs & Stratton Animal 206cc 12 cubic inch over head valve racing engine is hand built by master engine technicians and tested in the skunk works factory in Milwaukee, Wisconsin. Briggs & Stratton Motorsport department have taken the latest in engineering, manufacturing, and testing to design from the ground up, a dedicated RACING engine. The Briggs & Stratton Local 206 Racing engine uses the same cylinder head, valve train and camshaft and short block as the other models in the Animal family. The LO 206 or Local Option engine is a 12 cubic inch 206cc engine with a forged steel 3/4 crankshaft PTO, squeeze cast conrod and performance camshaft. Its different features to other members of the Animal family is it is designed for class racing. The PVL ignition coil limits the Local 206 engine to 6100 RPM. 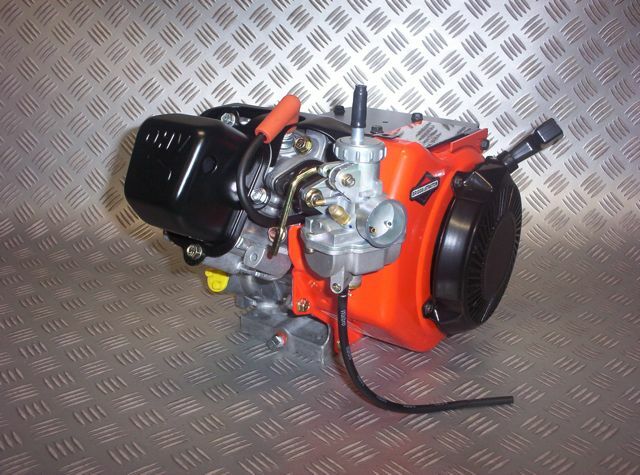 The Briggs & Stratton Local Option 206 engine block is fitted with two Anti tamper engine side cover seals to prevent modifications & is supplied with an engine build specification sheet to keep the rule set for class racing and competitors on an even level. The Briggs & Stratton Local 206 racing engine can be used on both dirt & bitumen tracks & has standard features included with every engine. Below are just a few of the components used in the Briggs & Stratton Local 206 race engine. High RPM rated flywheel, fixed rpm limited PVL ignition coil, heavy duty blower housing, forged steel crankshaft, camshaft compression release for easy starting, Anti tamper engine block seal, Factory engine specification build sheet. Small Engine Performance can supply a factory delivered Briggs Racing LO206 crate motor through to a complete package with all accessories. 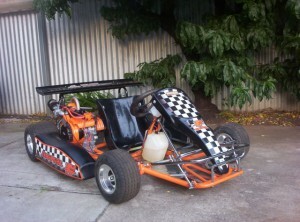 Small Engine Performance can supply additional components to complete you go kart racing package. All Local 206 race engines are factory sealed with anti tamper engine seals fitted to both front & real of the engine block & side cover. The Animal M series is the first dedicated factory produced racing engine for the Quarter Midget racers, it shares many of the components used in the proven Animal engine. The Briggs & Stratton Animal M series is ready to race straight out of the box. Each engine is hand-built and tested in the skunk-works Milwaukee, Wisconsin factory. The Animal M series engine is supplied with a splined crankshaft, 6100 RPM limited digital ignition and a 6.0 to 1 reduction gearbox is also available. The Briggs & Stratton Animal Racing engine uses the same components including cylinder head, valve train and camshaft and short block as the other models in the Animal family. The Briggs and Stratton Animal engine is a 12 cubic inch 206cc engine with a forged steel 3/4 crankshaft PTO, squeeze cast conrod and performance camshaft. Its different features to other members of the Animal family is it is supplied without side cover anti tamper engine seals and is fitted PVL ignition coil that limits the engine to 12000 RPM. 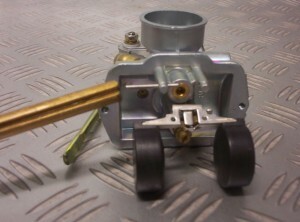 The Animal is an ideal engine for engine builders wanting to modify there own or build a blue printed engine. 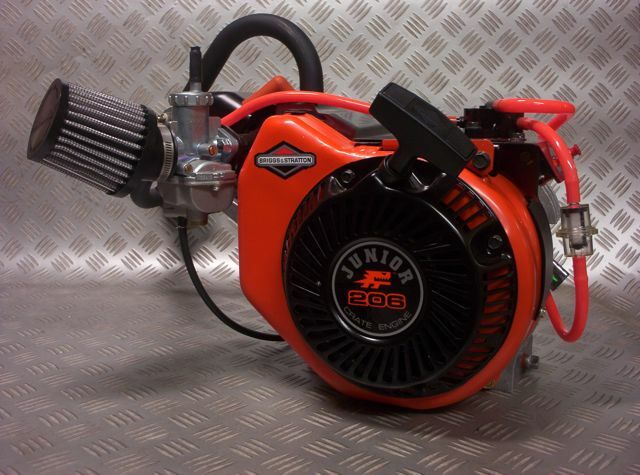 Entry level junior 206 Animal crate engine offers all the torque as a standard Animal engine but uses a longer carburettor slide & rpm limited pvl ignition module to control the speed of the engine when fitted to kids & rookie karts. The factory sealed junior 206 racing engine is available as a complete ready to run engine package including header pipe & muffler, fuel pump, clutch, air filter, engine mount and other components to suit your application. Briggs & Stratton LO206 factory sealed racing engine is fitted with a 6100 rpm rev limiter that is part of the ignition coil. 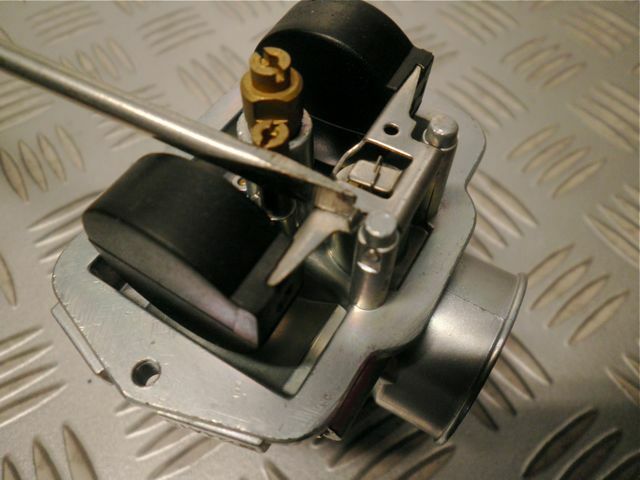 The PVL coil is a sealed unit that is Green in color for easy identification, each PVL coil used on the Briggs & Stratton Animal and World Formula engine is a different color to represent its rev limiter. 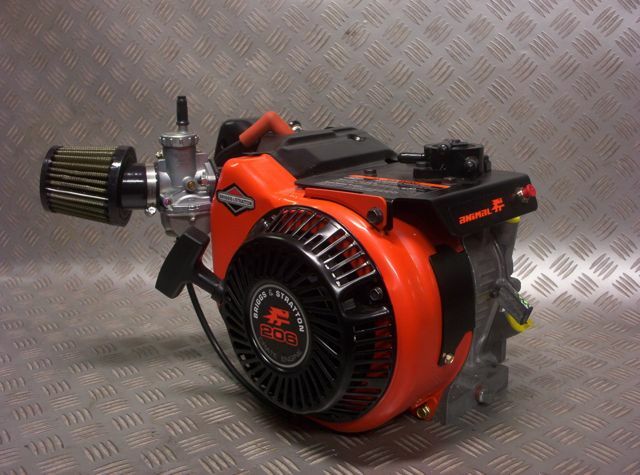 Briggs & Stratton animal fitted with optional recoil starter the Animal can be used and raced straight out of the box with some simple tuning and set up, it produces around 8.5 horse power and delivers lots of torque across the rev range. 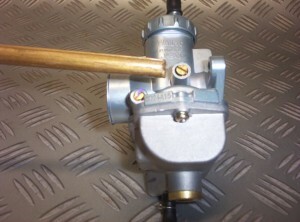 The Animal is fitted with the 12000 RPM limited blue PVL electronic coil. 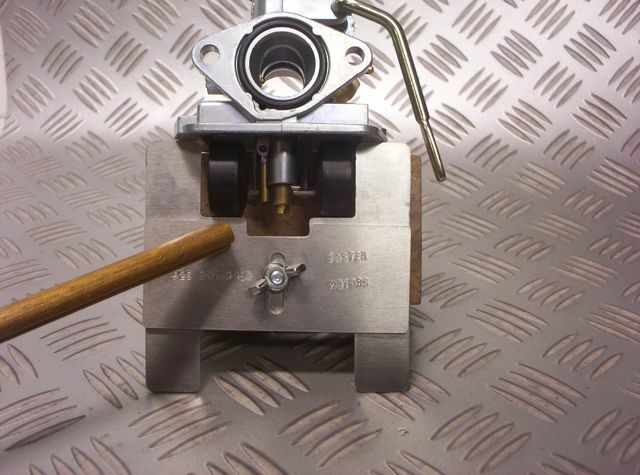 For a full range of replacement parts, engine pricing and engine packages please view our online store. Note when using Aussiespeed AS0206 Curved manifold the float height should be set at 23mm to 24 mm and the drop is 26mm. Due to the carburetor sitting on a different angle small adjustments may be required. This is the position used to measure the float height. 22mm is a good starting point. Remember bend the tabs not the float.The higher the number when measured in this position lowers the float level, an example is if your spark plug is black and the idle mixture screw doesnt change it by increasing the float level to 23.5mm with the carb up side down lowers the float level. the float pin is easily removed to make adjustments to the float tabs. 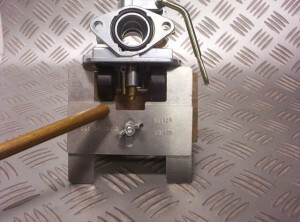 The brass fitting that is below the float pin in the picture is the seat for the needle. right at the tip of the screw driver you will see a small tag that is bent towards the screw driver. 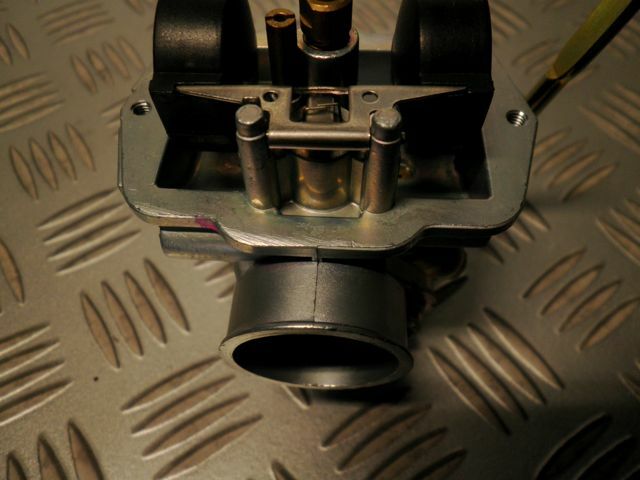 This is the tab that is bent to set the float drop, the drop measurement controls the distance the float holds the needle open to allow the fuel bowl to refill. 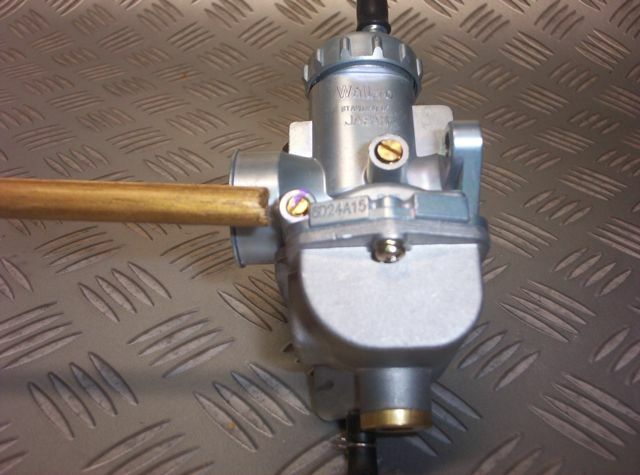 The float drop is set & measured in this position float drop needs to be set to around 1.050 or 26mm, If the float drop is set at a larger number the needle valve can drop out of the seat chamber. between the 2 posts that hold the float pin the needle has 2 over lapping wires. this is the tab that gets bent to adjust the float height.let the needle sit at rest when setting the float level, do not press it hard on the seat. When it comes to the first time to run a new Briggs & Stratton racing engine this is the procedure we recommend for the break-in period. Briggs and Stratton Animal, Local 206 & Junior 206 engines are air cooled engines and use a splash feed oiling system. With the correct oil the engine is ready to race after a break in period. We recommend and have run engine from brand new out of the box with RED LINE RL157/ We now use Briggs Amsoil 4T synthetic oil. We do not recommend mixing brands of oil & do not run our engines in on Mineral or running in oils. We use redline/ Briggs Amsoil 4T from day 1 in our engines, we have customers that use other oils but we have had great results with the RL157 redline oil Briggs Amsoil 4T and continue to use it. Careful preparation & taking the time to learn how to set the float level, carb mixture and idle speed will help you to understand and to be able to make adjustments to your engine. 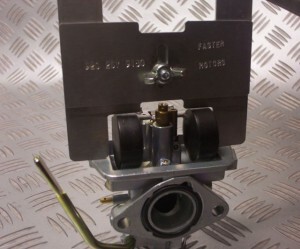 Next we suggest you add 480ml/500ml of high grade engine oil suitable for air cooled splash fed engines not oils designed for four stroke water cooled or heavy weight automotive oil.. Use the recoil starter top pull the engine over to get the fuel up to the carb.Briggs & Stratton racing engines are fitted with a chokes & should be used for cold fire ups. We always loosen the rocker cover bolts slightly, the reason we do this is once the engine fires & you see a tiny drip of oil coming from the rocker cover where it seals on the cylinder head.When the engine is running you will know that the oil is at the top end of the engine & the valve train is being lubricated.Shut the engine down tighten the rocker cover bolts & follow the next steps. Get the engine to fire & run the engine for around 10 minutes with no load, We normally do this in 2 to 3 runs of around 3 to 5 minutes each DO NOT HAVE THE CHAIN CONNECTED TO THE CLUTCH & REAR AXLE WHILE REVING THE ENGINE EVER. rev the engine to around 2000 RPM varying the revs from above idle to 2000 rpm.If you want to do the run in with 3 minute runs that is fine, Try not to let the engine idle as it is important with a splash feed engine keeping the revs up above idle will get the oil slinging & splashing over the moving parts, cylinder walls & the engines valve train.If an adjustment needs to be done switch the engine off make the adjustment have a quick look at the oil level through the filler plug the restart & continue the first break in period. After this first stage let the engine sit for 5 minutes for the oil to return from the top end of the engine then while the engine oil is still warm drain the oil. This first drain should remove any material from the cylinder walls or bearing material from the internal rotating assembly of your gokart engine. Refill Your Briggs Racing Engine with 550ml/600ml of Redline/ Briggs Amsoil 4T 4 stroke go kart oil fit & tension the chain restart your engine & get it out on the track & run it around for about 15 minutes vary the engine speed & always keep the revs high enough to keep the clutch engaged.Keep your Briggs & Stratton racing engine below 5000 RPM for this second part of the engine break in.After you have done around 15 minutes of driving time its time for another oil change. let the engine sit for around 5 minutes drain the crank case & refill the engine with another 550ml/600ml of Red Line 4 stroke synthetic or Briggs Amsoil 4T go kart oil. Once your engine is refilled & you have checked over your engine that the exhaust is not leaking & the nip up the nuts on the manifold your Briggs and Stratton Animal is ready to race. 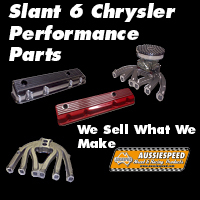 Small Engine Performance offer our customers the range of AussieSpeed Small Engine Performance Parts, AussieSpeed offer Intake manifolds for Briggs & Stratton Animal engines that places the carburettor in the same position as the Briggs & Stratton World Formula engine. 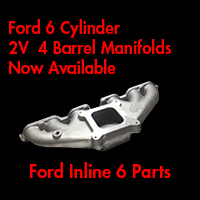 Independent testing has shown an increase in horse power can be possible when the intake manifold is installed. 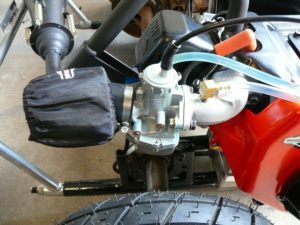 When fitting larger tires the intake manifold on the Briggs & Stratton Animal series engines can be in the way of the rear tyre, this can also happen when you are limited to engine position in regards to sprocket position. The Aussiespeed AS206 curved Animal intake manifold is available in our online store.